Convert the screen coordinates to world coordinates (the rectangle in screen becomes a trapezoid in the surface of the water, I guess) and decide what ships are inside that trapezoid. 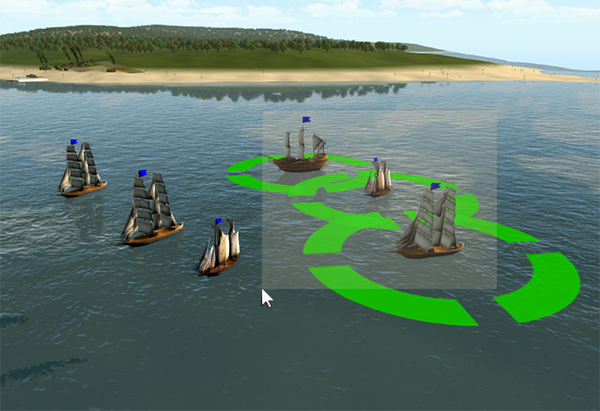 Convert the world coordinates of all ships owned by the player (shouldn't be too many, after all) to screen coordinates in order to see what ships are inside the rectangle. After that I had to spend some time fixing the traditional "click" selection so it still behaved correctly. I think the main issue I faced was the fact that I ignore all clicks done over the UI (so you don't click through a window and end up selecting a ship that is behind it) but at the same time the selection rectangle is a UI element as well. So when you click and release in the same position you are essentially creating a 1x1 pixels UI element that blocks the click and you end up being unable to select cities or ships or doing anything else. My solution? Do not draw the selection rectangle if its size is less than 5x5 pixels. Not an elegant solution, I guess, but it worked like a charm. In that way, you manage to avoid the overlap and they even look like they are in some sort of formation. Anyway, I won't speak anymore of technical details, here is a gif showing the final result. I am pretty pleased with it! Excuse me, miss, but do you like the dubstep?